How Dangerous Are Modern Nuclear Weapons? The National Archives and Records Administration has released a detailed study that offers new insight into United States’ Cold War planning (like how to execute World War III and annihilate mankind) in 1959 including the systematic and overwhelming destruction of urban-industrial targets, purposefully targeting civilian populations in all cities, including Beijing, Moscow, Leningrad, East Berlin, and Warsaw, by dropping atomic bombs eight times the yield of the bomb that destroyed Japan’s Hiroshima. While we are glad that WWIII didn’t happen then, today’s simmering tensions and the return of great power politics bring with it the risk of powerful states going to war unleashing previously unseen forms of warfare and using nuclear weaponry to inflict unthinkable irreversible damage on the enemy state. Don’t believe us? Well, Russia is developing a drone submarine, dubbed Kanyon, capable of “damaging the important components of the adversary’s economy in a coastal area and inflicting unacceptable damage to a country’s territory by creating areas of wide radioactive contamination that would be unsuitable for military, economic, or other activity for long periods of time” – in layman’s terms, Putin is developing an underwater drone that can deliver a nuclear warhead and wreck havoc on American shores. Nine countries together possess nearly 16,000 nuclear weapons. The United States and Russia maintain about 1,800 of their nuclear weapons on high-alert status – ready to be launched within minutes of a warning. 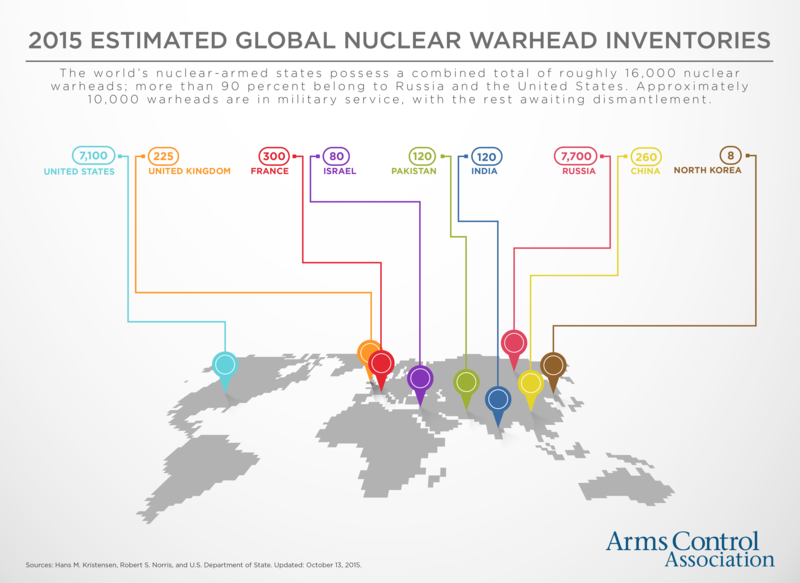 While China, France, Russia, United Kingdom, and the United States are officially recognized as possessing nuclear weapons by the nuclear Nonproliferation Treaty (NPT),India, Israel, and Pakistan are known to possess nuclear weapons – though the three never joined the NPT. North Korea had been a party to the NPT but withdrew in 2003. It is estimated that the Democratic People’s Republic of Korea has 6-8 plutonium based warheads as of 2015. America detonated the first ever nuclear weapon in a New Mexico desert on July 16, 1945. The Trinitytest yielded about 20,000 tons of TNT, enough to cover an estimated area of about five square miles in radioactivity. 70 years since, nearly 2,000 nuclear tests have been performed, and about 125,000 nuclear bombs have been built. The two nuclear bombs dropped on Hiroshima and Nagasaki during WWII yielded about 36,000 tons of TNT and killed at least 129,000 people. Looking at the amount of energy discharged and the subsequent catastrophe, they (Little Boy dropped on Hiroshima and Fat Man dropped on Nagasaki) could easily be termed extraordinarily powerful explosions. But 16 years later, on October 30, 1961, Russia detonated Tsar Bomba with the force of 3,800 Hiroshima explosions; tested with a yield of 50 million tons of TNT, it was and still remains the most powerful nuclear weapon ever detonated. The ensuing detonation threw up a mushroom cloud 64 kilometers high and would’ve subjected anyone 100 kilometers away to third degree burns. It was originally supposed to deliver a yield of 100 million tons, which would destroy an area the size of Connecticut. After the Soviet Union conducted its first nuclear test explosion in 1949, the United Kingdom (1952), France (1960), and China (1964) followed. Between 1945 and 1990, more than 70,000 total warheads were developed, in over 65 different varieties, ranging in yield from around .01 kilotons to the 25 megaton B41 bomb. 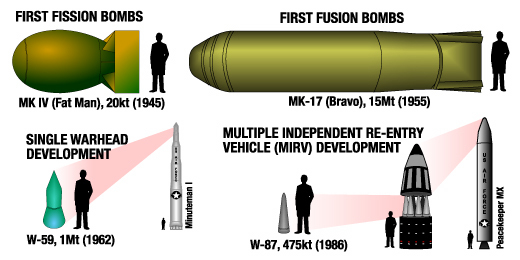 At the height of the Cold War, thousands of US and Soviet ballistic missiles on high alert were capable of delivering up to 10 independently targeted warheads at a time, each one 20 times more powerful than the Hiroshima bomb. At the peak of its arsenal in 1988, Russia possessed around 45,000 nuclear weapons in its stockpile, roughly 13,000 more than the United States arsenal, the second largest in the world, which peaked in 1966. By the end of the Cold War, the US was estimated to hold about 3.8 billion tons worth of nuclear weapon yield. B83, the most powerful thermonuclear weapon currently in the US’ arsenal, yields 1.2 million tons (75 times the yield of Little Boy), equal to about 200 square miles of devastation. America has 650 B83s. In October, the US Air Force successfully tested a B61-12 nuclear gravity bomb for the third time. While the B61-12 has a maximum yield of only 50 kilotons (remember B83 has 1,200 kilotons) and is a relatively low powered weapon compared to its previous versions, it is being considered as the most dangerous nuclear weapon in America’s arsenal for its accuracy and usability. Since it can produce less nuclear fallout than earlier nuclear weapons and strike within 30 meters of its target, America can use a nuclear bomb for the first time since the 1940s – without thinking twice. RDS-6 (Joe-4), Russia’s first thermonuclear bomb, has a yield of approximately 400 kilotons of TNT. TheRDS-220 hydrogen bomb (Tsar Bomba) is the biggest and most powerful thermo nuclear bomb ever made; you have already read what devastation it is capable of unleashing. Russia’s nuclear triad includes Strategic Rocket Forces (land based): 489 missiles capable of carrying up to 1,788 warheads; Strategic Fleet (sea based): 12 submarines capable of carrying up to 609 warheads; and Strategic Aviation Units: 79 bombers capable of carrying up to 884 Cruise missiles. The threat of WWIII is real with the current political landscape, war in Syria as well as other international conflicts, and Turkey drowning Russia’s warplane. With WWIII, the threat of a nuclear war looms large. Ironically, the main argument for nuclear weapons is to prevent attacks from nuclear weapons. Nonetheless, the US, UK, Russia, France, and China have agreed to stop making nuclear weapons and destroy current stockpile overtime. These five along with India, Pakistan, Israel and North Korea have promised not to resort to nuclear bombs unless attacked by one. Whatever the case may be, it doesn’t really matter how big or small a nuclear weapon is. Every single one is capable of unmitigated devastation. This Article (How Dangerous Are Modern Nuclear Weapons?) is originally published by Vandita at anonhq.com republished under a Creative Commons license.